After leaving San Francisco I had a choice of routes out of the Bay Area. Given that CA 35 still had a closed portion along the one-lane segment south of CA 9 I decided on CA 1 along the coast instead. I hadn't been on this particular stretch of CA 1 since a family trip all the back in 1993 when I was living in Connecticut. After jumping onto I-280 from US 101 I made my way southwest where CA 1 multiplexes onto the freeway. I-280/CA 1 southbound leaves the City of San Francisco and enters Daly City in San Mateo County. From I-280 I followed CA 1 southwest out of the city towards Pacifica. CA 1 crosses over CA 35 on Skyline Boulevard before approaching the coastline. The freeway alignment of CA 1 ends in Pacifica and it drops to a normal at-grade state highway. South of Pacifica CA 1 starts to climb into the Santa Cruz Range and begins to approach the Devil's Slide. 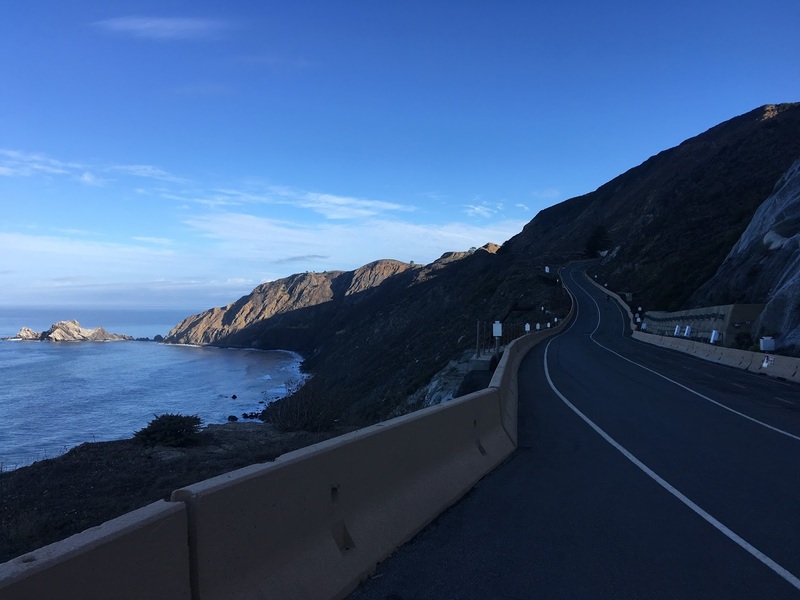 The Devil's Slide area of CA 1 has seen three major realignments throughout it's service history as a state highway. Presently the area is served by the Tom Lantos Tunnels which opened to traffic 2013. Both tunnels are a single lane are are a little under one mile in length. From 1936 onwards to 2013 when the Tom Lantos Tunnels were completed CA 1 was routed along the coastline via the Devil's Slide. The Devil's Slide area of CA 1 was infamous for rockfall along the high coastal bluffs. After the Tom Lantos Tunnels were completed the former roadway of CA 1 was converted into a 1.3 mile walking/biking trail. The Devil's Slide Trail can be accessed from both ends of the Tom Lantos Tunnels. I recall actually stopping here back in 1993 with my family to take a picture of the high cliffs, if I remember correctly my Dad thought the area was part of Big Sur. The original alignment of CA 1 in 1934 prior to the Devil's Slide between Montara and Pacifica was over Pedro Mountain Road. I don't have the exact alignment CA 1 took through Montara but the alignment over Pedro Mountain Road and Higgins Way are very apparent on the 1935 California Division of Highways Map of San Mateo County. I'll be referring to the below map several more times given how much the alignment of CA in San Mateo County has evolved over the years. Today driving Montara on CA 1 is essentially a "blink and you'll miss it" affair. Immediately south of Montara CA 1 passes by Moss Beach and El Granada before entering Half Moon Bay. CA 1 meets CA 92 in downtown Half Moon Bay. The original junction was just to the east when CA 1 ran on Main Street. South of Half Moon Bay CA 1 approaches Purisima Creek and CA 84 at San Gregorio Road . The original alignment of CA 1 was more inland along Verde Road and Stage Road which can be seen above on the 1935 San Mateo County Map. Modern CA 1 follows the coastline south passing Bean Hollow State Beach. Suffice to say the views above Bean Hollow Beach are quite striking. The original alignment of CA 1 continued south on Stage Road to Pescadero and used Pescadero Creek Road in addition to Bean Hollow Road to meet the modern highway. The original alignment of CA 1 I described from Half Moon Bay south to Bean Hollow State Beach appears to have been replaced by the modern alignment sometime between 1940 to 1942. CA 1 passes by the Pigeon Point Light Station State Historical Park. The Pigeon Point Lighthouse is the tallest lighthouse in the west coast of the United States at 115 feet high. The Pigeon Point Lighthouse was built in 1871, lit 1872, automated by 1974. Pigeon Point Road was the original alignment of CA 1 as evidenced by 1935 San Mateo County Map above but I'm not sure it when it was replaced. The alignment of CA 1 south of Pigeon Point to the Santa Cruz County line appears to be close to original. There appears to be an inland alignment via Old Coast Highway at Gazos Creek according to the 1935 San Mateo County Map. At the southern extent of San Mateo County CA 1 south passes by Ano Nuevo State Park. The key feature of Ano Nuevo State Park is the namesake island. Ano Nuevo Island is 9 acre island which is a known breeding ground of the Elephant Seal and Stellar's Sea Lion. Ano Nuevo Island can be viewed from CA 1 near the Santa Cruz County Line. Entering Santa Cruz County CA 1 passes over Waddell Creek on a 1930s era bridge before entering Davenport. CA 1 passes over a series of rails in Davenport which I believe are used to transport cement. Between Davenport and Santa Cruz CA 1 appears to have once used Scaroni Road according to the 1935 California Divisions of Highway Map of Santa Cruz County. I find the Scaroni Road alignment interesting because that former alignment now crosses over Majors Creek on a wooden bridge. In downtown Santa Cruz CA 1 take a northward swing. Continuing on Mission Street will take you to the Santa Cruz Mission which was part of the El Camino Real. Mission Santa Cruz was founded in 1791 with the original building finished by 1794. The 1794 mission was destroyed in an earthquake in 1858 but was replaced by the Holy Cross Church in 1889. The school house apparently dating back to the original mission on School Road east of Mission Plaza. The replica mission next to the school dates back to the 1930s and was based off a painting of the original mission. Leaving Santa Cruz I passed both CA 9 and CA 17. The Mud Creek slide zone not with standing I've driven every mile of CA 1 from Point Reyes Station south to San Luis Obispo this year. One of these days I'd like to drive all 656 miles of CA 1 in one shot, but that will likely be close to impossible given how prone parts of the highway are to mudslides.